Whip up this easy coconut flour mug cake for dessert in 90 seconds. 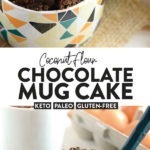 This chocolate mug cake is paleo, grain-free, refined sugar-free, and can easily be keto! It’s mug cake time! 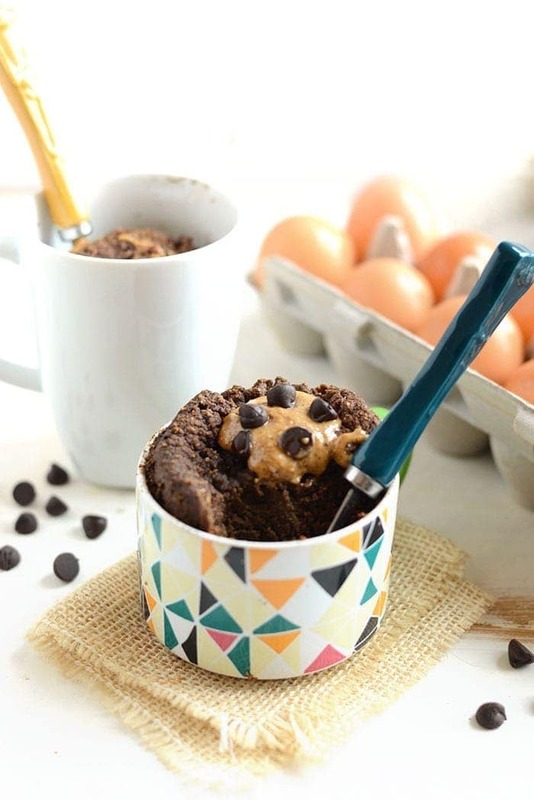 If you’re a lover of dessert, but need a little portion control assistance, mug cakes need to be your best friend. 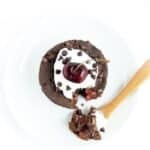 This very chocolate mug cake recipe is my all time favorite. It’s made with wholesome ingredients and in just 90 seconds. Dessert in 90 seconds? Yes, please! This dessert is special in that it’s made with no refined sugars and no grains at all. 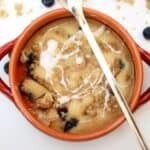 It’s actually made with a coconut flour base, which I know a lot of you love because it’s paleo and keto. Let’s chat coconut flour for a second here. I want to share why I love it! Like I mentioned above, coconut flour is considered both keto and paleo because it’s lower in carbs and grain-free! Per 2 tablespoons: 60 calories, 1.5g fat, 9g carbs, 3g sugar, 3g protein, 5g fiber. 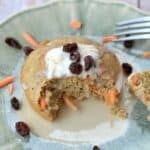 If you’re specifically looking for the carbs in coconut flour, you’ll note that there are 9g carbs in coconut flour, which makes it a great low-carb baking option. Start off by spraying your mug with coconut oil cooking spray. Make sure you fully coat that sucker so nothing sticks. Then, add in all of the dry ingredients and mix. Whisk together wet ingredients in a separate small bowl and then pour into the mug. Mix together all ingredients. Microwave on high for 90 seconds to 2 minutes. Top with your favorite nut butter and dark chocolate chips. First, spray a coffee cup with coconut oil cooking spray and set aside. Then, mix together all of the dry ingredients inside of the coffee cup. Set aside. In a small bowl, whisk together maple syrup, egg white, and almond milk. Then add the wet ingredients to the dry ingredients and mix again. Microwave on high for 90 seconds to 2 minutes. Top with your favorite nut butter and dark chocolate chips. PS: If you love single-serve desserts, you should check out our ebook, 34 Healthy Single-Serve Dessert Recipes for just $5!